Two goals in two minutes was enough for Cockburn City to secure a 2-2 draw with Armadale in round 18 of the PS4 NPLWA season at Dalmatinac Park on Saturday. 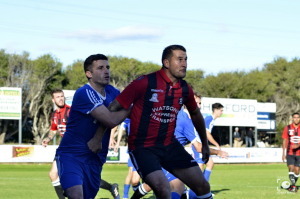 Armadale stunned their opponents with two quick goals in the second half, but their lead was short-lived as Cockburn responded with two goals of their own just three minutes later. Cockburn coach Scott Miller said that a draw was a fair result in the end but was disappointed his side couldn’t find a winner. “In the first half I thought the game was even and there weren’t many chances for either side,” he said. “But in the second half they sucker punched us with two goals and then I thought we took control of the game and dominated from thereon. The home side had a chance to take the lead on the cusp of half-time when a through ball put Julian Teles one-on-one with the keeper. However Armadale’s Michael Craggs was quick to react as he rushed forward in order to deny the striker’s attempt to slide the ball past him. Armadale made it 1-0 in the 54th minute when Ali Gholami curled a free-kick around the wall and past Cockburn keeper Luke Radonich. James Atkins doubled his side’s lead just two minutes later when he headed home a cross from Charlie Kenna. The two goal buffer was short lived as Gian Albano from Cockburn made space in the box with a nice piece of skill before drilling a low shot past the keeper to peg the score back to 2-1. Just a minute later, a deft touch from Daniel Robinson put Teles through on goal and this time he finished comfortably to draw his side level. Both sides continued to create chances in the final stages of the match, and it was Armadale who came closest to finding a late winner in the 85th minute. Armadale coach John O’Reilly thought his side should have won the game but was pleased with their attacking performance. “We just switched off for two minutes and that’s what cost us two points in the end,” he said. “After that we got back into our stride and created enough chances to win the game but unfortunately the shots that should have found the back of the net ended up drifting wide.